Similar to a live microbe, vaccines can also provoke an antibody response. The vaccine can be composed of a live or attenuated microbe, a whole non-proliferating microbe, or an antigenic part of the microbe. 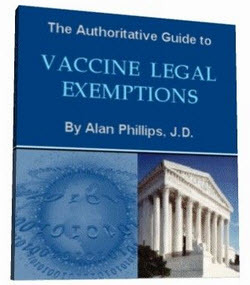 Regardless, the intent of the vaccine is to produce protection, often by protective antibodies. Although the half-life of an individual IgG molecule is less than a month, a population of antibodies in the IgG isotype form may persist for life. Memory B cells can sustain these antibodies and retain the ability to quickly generate the appropriate antibodies when challenged. 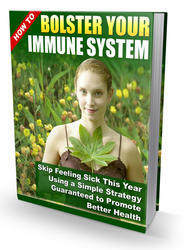 When the immune system encounters another infection or is subjected to a revaccination (booster), the result is an accelerated production of the particular antibody and increase in the levels that circulate in the blood. Figure 14.1 illustrates this. 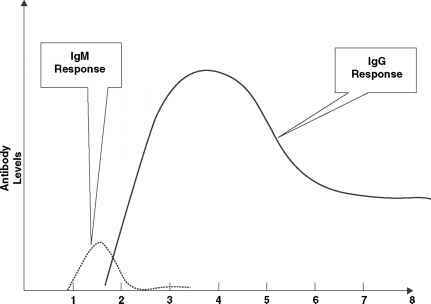 Perhaps the most discernible pattern of antibody response which has forensic value is the appearance of IgM first, followed by a B-cell switch to the longer lasting IgG. During the early phase of exposure, IgM can be seen first. As time goes on, IgG is seen and predominates, and IgM is no longer found. This is illustrated in Figure 14.2. 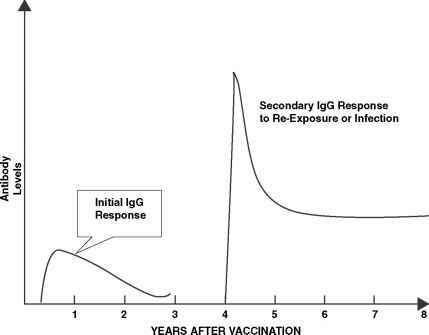 FIGURE 14.1 Illustration of the IgG antibody response to a vaccine antigen after the first immunization and subsequent exposure by natural exposure to the infectious agent or by another vaccination. antigen (EA) and viral capsid antigen (VCA). It is rare to find IgG antibody to the VCA or Epstein Barr Nuclear Acid (EBNA) in anything but low titers. As the patient recovers from their first infection with EBV, it is rare to find anything but low levels of IgM to EA or VCA, but IgG to VCA in higher or increasing levels is common. Antibodies to EBNA are often very low during this stage. Then after clinical recovery, that is, several months later, IgM to EA and VCA stay at low levels whereas IgG to VCA and EBNA remain at high levels, often for years. Table 14.3 illustrates this pattern by stage of the immune response to EBV and its particular antigens. Figure 14.3 is a graphic display of this. For the clinician or epidemiologist this provides a framework to determine where in the infectious process a patient may be. Tables 14.2 and 14.3 and Figures 14.2 and 14.3 illustrate how responses to a biothreat agent or its toxin may be used to give some chronological indication of exposure. Combining the antibody response with detection of particular antigens can provide further definition as to the stage of infection or exposure.